The Barents Sea region is an example of both the regional variability of structural styles and the fundamental control of Basement on the manifestation of depositional and structural features integral to the petroleum system of this region. Examples include steeply dipping reactivated faults that produce deep, elongate to circular basins and strike-slip systems producing pop-up and pull-apart geometries, or the expansive distribution of Early Triassic source rocks within the oil window. The Barents Sea SEEBASE® Structural Study and GIS is a cost-effective regional evaluation tool that gives a first-pass perspective on the geology of this complex area. It provides a basis for focusing future exploration and data acquisition strategies, reducing exploration risk and regional petroleum system analysis. For example fluid focusing modelled on basement predicts known hydrocarbon accumulations, which indicates this high resolution map of Basement could predict undiscovered hydrocarbon accumulations. Oblique 3D views of the Barents Sea SEEBASE. Fluid Accumulation pathways with oil and gas fields. The tectonic history from the Paleoproterozoic accretion to Eocene formation of oceanic crust and late Cenozoic uplift, through tectonic terrane history and structural event maps, including corresponding plate reconstructions and paleogeographic maps. The basement heatflow showing the contribution from radiogenic and stretching induced thermal anomalies indict a high background heatflow with low radiogenic basement lithologies defining the heat flow trend into the Eastern Barents. Major structure formation events and locations coupled with a model of source rock maturation and migration points to hydrocarbon traps and seal risk. Fault maps to understand the localisation of sediment pathways at key depositional phases. The role of particular trending fault sets as conduits and controls on the distribution of volcanism. Revised basin thickness maps with analysis of possible hydrocarbon generative potential. Basement Geology: A detailed description of up to 17 basement terranes which include attributes such as age, composition and structure. Documenting the tectonic history from the Paleoproterozoic collision through Cenozoic orogenesis and formation of Oceanic Crust. 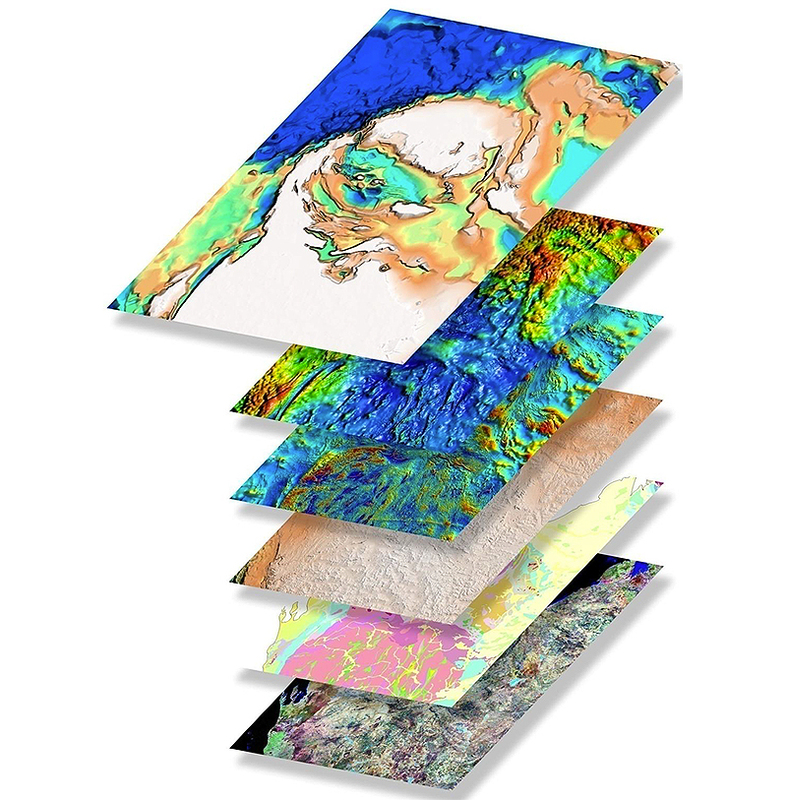 Potential Field Datasets: FROGTECH's state-of-the-art geophysical processing and enhancements of public domain gravity and magnetic data, including several FROGTECH Geoscience proprietary enhancements and a suite of filters. Plate reconstruction models: Fully consistent kinematic models have been defined for key tectonic events. Tectonostratigraphic History: Associated fault movements are described for ten key tectonic events from the Silurian to the Pleistocene and illustrated by fault event/response maps. Depth to basement - SEEBASE: 3D geometry and depth of basement surface highlighting the morphology of basin depocentres and basement highs. Maps of sediment, crustal and basement thickness, as well as crustal extension: Derivative maps created using SEEBASE. Inferred Basement Heat Flow: Computation of radiogenic heat production and heat flow, integrating basement geology and architecture, as well as timing and intensity of regional tectono-thermal events. Petroleum System Elements: Analysis of core elements, source generation and risk factors. Barents Sea SEEBASE ArcGIS includes project ready geo-referenced, integrated datasets that can be optionally further calibrated with client data ensuring improved insights and new ideas on basin architecture and evolution, as well as a better understanding of the extent of known and new depocentres. Each SEEBASE study is designed to be project ready. The Barents Sea SEEBASE Structural Study and GIS is supplied as a fully integrated geophysical and geological study of basement and basin evolution of the Barents Sea at a regional scale using public domain datasets enhanced using Frogtech Geoscience processing. The SEEBASE model for basement topography provides a new view of basin geometry and a foundation upon which to build basin, petroleum systems, and play models. The study also presents a regional tectonic synthesis and interpretation that includes descriptions of basement terranes, Frogtech Geoscience plate reconstruction models, basement composition, and basement-derived heat flow. The Barents Sea SEEBASE Structural Study and GIS is based on public domain potential field datasets, geological maps, plate reconstructions, literature, published cross-sections and wells. The study presents a regional tectonic synthesis and interpretation that includes descriptions of 17 basement terranes, FROGTECH plate reconstruction models and fault events for ten key tectonic events from the Silurian to Pleistocene. Start with the best suite of potential fields grids, tectonic reconstructions, depth to basement map and heat flow modelling on which to develop new exploration concepts and strategies. Know the limits and depths of basin systems and tectonic drivers for formation. Understand what controls trap formation and modification with distribution maps of active faulting and regional uplift areas. Reduce risk away from calibration models for basin and thermal modelling - Full coverage models of present-day basement heat production and heat flow calculated from basement composition derived heat production, crustal thickness and tectonothermal history. Interpreted structure is fully attributed to capture kinematics and tectonic history.